LiFT: Tell us something about you. How and when did you start writing? Ameya: Sometimes I ask myself the same question. Who am I? I don’t know what I seem to people from outside but from inside I am as confused as anyone else, sometimes directionless, weird. I like observing things. Sometimes I am fun loving, sometimes I want to be alone. Sometimes am the most energetic person you meet, sometimes I just can’t get out of the bed. Food is where I find my solace. I always use to worry or you can say overthink about what is the meaning of life. From the childhood itself. Why are we here? What is our purpose? All these stupid questions use to trouble a 14-year-old me. I felt that there is more to life than the theoretical lessons and academics. It was then when I first started penning down the stories and observations with family and friends. LiFT: Tell us about your book and your inspiration behind writing it. Let me ask you did you ever have an urge to take a dive through yourself and explore the seen but unfelt feelings? If yes then this book is for you. The book is divided into 7 sections. THE BEGINNING deals with the very basic mantras of life to start with. The ABOUT LIFE section takes you on a tour to understand what life is about and its various aspects. EXPLORING YOURSELF helps you understand yourself better by putting light on various elements of human psychology like Subconscious mind, hope, anger, fear. Then comes the everyone’s favorite part LOVE- A WEIRD CONCEPT, it takes you on an exploration of your deepest feelings of love for someone, the strength of a bond, the phases one goes through while in love. The next part SOCIETY AND YOU tells the reader about his connection with the society, its importance and how one can enhance his standing among people. It also gives you a basic understanding of different types of people. DEVELOPING THE INSIDE YOU – it’s a quick guide to develop your personality, your inner self and how to shine as a person. I HAVE LEARNED- This consists of one-liners based on the experiences and research I had which are separated on basis of a career, yourself, love etc. To excel, one can fathom these subjects as mention in the book. The book also consists of stories about incidents happened with me, some from the internet and even from my reading to understand and connect with things better. And trust me there is no need to follow a particular order to read the book, you can pick up any random topic or page and you can still connect with it. That’s the beauty. I never thought I could write even a page. Many feelings use to remain intact in the heart so during school I thought of noting them down in black and white. Writing that one page at a time kept me inspiring. My mom kept the small 100 pages book which I wrote in school seven years back and always use to remind me of that ( Hope to get that published soon). A LEAP WITHIN is thus a result of that little spark that was lit during school and which was nurtured and encouraged so well by my parents. I must say Once you take the first step your mind keeps you passionate about it. For me Writing gets addictive. When I start it, I need it more than my next breath. Give it a try. LiFT: How is your experience with your publisher? Ameya: –The experience I had with my publisher was filled with quite a lot of emotions. Working together as a team is a must. There are often differences but you have to overcome those for the benefit of those. A good publisher helps a lot on the journey. LiFT: What do think about the literary world and what are your expectations from it? 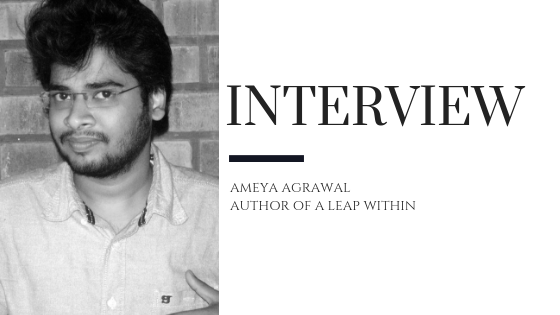 Ameya: The literary world in India is changing and is bringing up more and more opportunities for the writers and authors to get on board and share their work. From full-size novels to short stories, poems to micro tales, we are seeing artists in all genres. Though a lot of people due to lack of time complaining about not being able to read, the eBook format is solving the problem for them I hope. More vibrant and dynamic and even young talent is expected to rise. There are some issues as well, I may not understand them well but think some authors due to piracy, extremely cheap paperback copies on online sites, eBook version are not being paid enough. But I expect and hope that this problem solves soon enough in the coming future and more and more artist will be opting to serve literature as their career options. LiFT: What are your future plans in a writing career? Ameya: I will definitely go to continue writing till the end. As it is what sets me free. But if I am going to pursue it as a career or a fulltime profession, I think the time will tell me because As of now, I am myself not sure about it. Let’s see. LiFT: How much do you think marketing or quality of a book is necessary to promote a particular book and increase its readers? Ameya: It is said that if you market well, you can even sell dirt, but If you don’t, you can’t even sell gold. So marketing is indeed a very important aspect to promote your work, but even if you sell at first, your sales won’t last if your content ain’t good enough. Nothing can beat a good quality content. Both are like two peas in a pod. LiFT: What is the message you want to spread among folks with your writings? Ameya: Usually, we all just look at things but never see them. To excel, one needs to fathom ‘self’. 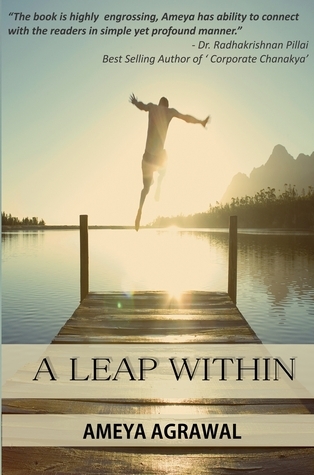 With my writing, I want to convey a message that encourages the readers to take a leap within themselves so to discover and explore such known but unfelt feelings which will lead to a successful life. LiFT: What do you do apart from writing? Ameya: I am a software engineer by day, Entrepreneur by Night. A Motivational Speaker and I also run a Mission named ‘ Lyrics of Success’ to help discover The Winning Way of Life. Am really glad that over 10,000 individuals are benefitted by these program till date. LiFT: What are the activities you resort to when you face a writer’s block? Ameya:I go to sleep, as you know that most of the things work out if you turn them off for some time, including you. It often helps. LiFT: What if your story will be adopted as a movie? Whom would you want to work as a director or actors in it? LiFT: What importance do a pen and word keep in your life? Ameya: Pen and word are like breath to me. I am an overthinker since childhood and the spaghetti of thoughts use to trouble me a lot. It was until the 8th grade that I discovered that putting my these thoughts on paper in the form of words made me feel like paradise. A soothing experience like finding solace. LiFT: What are your suggestions to the budding writers that they could improve their writing skills? Ameya: Sometimes you must write what you feel and not what others what you too, sometimes you have to do the quite opposite, you must write what people would love to read. Because if you want to choose writing as a profession, there has to be money into it. You cannot earn your bread and butter from the praises. You have to have something that sells. But if you write only because you find peace in it, you must write whatever soothes your heart. You don’t need to be an extraordinary writer always with a treasure of vocabulary, sometimes when you are able just to resonate your feelings with people no matter how simple they are, people will love you. So don’t let anything fool your heart and open up. Most often the feelings we keep avoiding are the ones which ones identified and expressed are loved the most. A great player or great maniac?